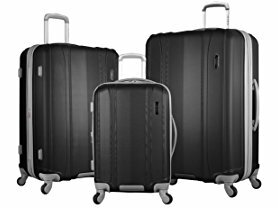 Hurry over because today only this Olympia USA Vitoria Luggage 3-Piece Set is only $119.99 (Reg. $300)! 4 color options to choose from! Made of rugged ABS material for durability, the Olympia hard side spinner luggage set makes the perfect travel companions. Each suitcase features four 360 degree spinner wheels, conveniently allowing zero weight movement in all directions. The lightweight aluminum push button locking handle system, lined interior and interior zippered divider with shoes pockets and mesh zip pocket keep your luggage safe and protected. An additional interior zip pocket and elastic tie-belt make travel even easier. Each suitcase expands for extra packing capacity within your luggage. *$5 flat rate shipping on this offer.